Most basically, Somatic Finance® means: including the body, along with the mind, in all matters of finance. But what does that really look like? To understand what Somatic Finance is, we must start with another question: what is embodiment? Embodiment is not a noun, but a verb; it is a way of being that is felt and integrated down to the bones – and beyond. In our disembodied modern world we don’t understand the term much less – pardon the pun – embody the way. Sourced in Integral Theory and applied in my Integral Coaching methodology, Somatic Finance is a unique experience and methodology developed and employed by me to serve you. Above all else, Somatic Finance is a path to financial integrity, your freedom. Somatic Finance sourced in the body is experienced as a Path of Practice, where money and body unite in service of our development. Ultimately, all humans seek authentic happiness, which is manifest through generosity. Finance needs our body along with our brain. The body is a reliable map for wisdom. The head, the heart and the belly are specific reliable systems that harbor unique insight and realization. By devoting attention to our mind, our belly and our heart, we open portals to a universe of untapped wisdom that serves our well-being. When we fully embody our natural home – the body – authentic and creative responses easefully flow from our expression in movement, communication, emotion, feelings and sensing. We tap in to the presently moving river of the now. The river may be flowing gently or may be level-5 white-water rapids. Regardless, when embodied, our way of being in the river is the same: fully present. Embodiment enables us to meet current reality without future fears and hopes, or past dreams and frets. When it comes to money, we tend to enter a unique territory of dis-embodiment. Not only is money generally seen as separate from life, it rarely enters our field of awareness for embodiment. This particular intersection of embodiment and personal finance represents largely uncharted territory for most people. Until we embrace this way of deeply connecting heart, mind and soul through the study and practice of Somatic Finance, and allow money to be an integral part of our development, we are restricting our full human experience. Because the current systems tangled in the tight web of our rational mind create pain and suffering. The brain can only repeat old habits, stories and beliefs – sometimes very creatively – to answer confusion, doubt, anger or despair. Your mind is doing its job. But when the mind befriends the body, a co-creative flow of new wisdom emerges that serves the rational mind rather than the other way around. We sometimes access freedom through the mind; but more often than not, when money enters the field, the mind closes down. 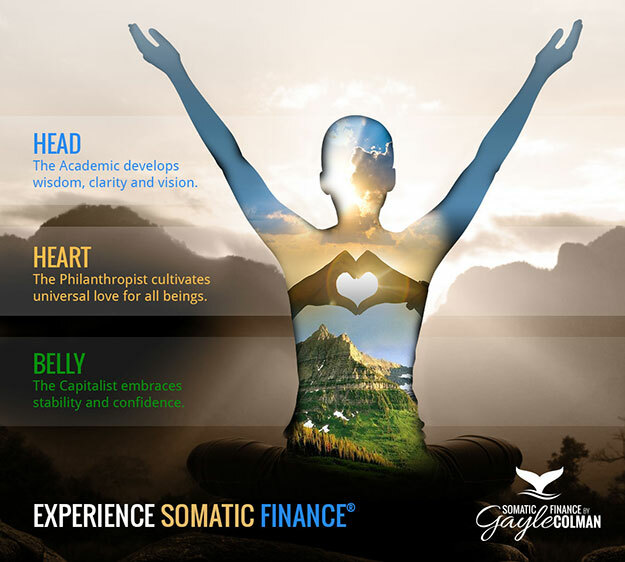 Somatic Finance is a new field of study, a practice and a methodology for connecting the brilliance of the mind with the integrity of one’s center, through the compassion of the heart. Somatic Finance calls us to embody our whole way of being, including all of the money experiences–past and present–that prevent us from fully engaging in life. Somatic is derived from the Greek word Soma, which denotes relating to the body. Somatic indicates an association to the human body, as distinct from the mind. 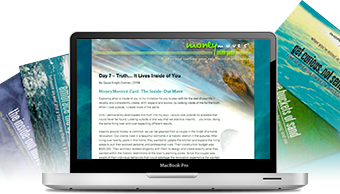 As an alternative to the predominant mode of operating primarily (if not solely) from the head when dealing with money matters, Somatic Finance calls us to open to the wisdom which each of us already carry in our body. When we are able to open to the wisdom, which is held in the body, and to more of who we really are, we see more. We experience more. We grow more. We make better choices. It is that simple. Body intelligence ranges from tightly closed to vastly open. Most of us are somewhere in the middle on this continuum. Movement on the continuum in one direction or another (towards opening or closing) depends upon our ability to live curiously, master the art of wonder, and be willing to grow. If you are not practicing curiosity, wonder and growth, most likely you are moving toward a closed state. We do not stay still – we are always, always, always, moving one way or the other. If we are open, we gain access to body wisdom. If we are closed, we are missing a source of priceless intelligence. Let us emphasize Somatic finance does not negate the mind, nor its capacity for intelligence and reason, particularly in the realm of finance. Rather, this approach calls our attention toward the body as a whole, as a source of intelligence, intuition and insight. More specifically, we look to three major areas of the body: the head, the heart and the belly. Each of these areas warrants a full articulation, understanding, and practice; these body centers are the locations of deeper meaning and insight. Some of the tools I utilize in our coaching engagements are MoneyMoves® Cards, MoneyMoves® Quest, and customized processes including deep conversation, interior and exterior financial application, cultivating results and sustaining evolution. At all times you can be confident that Somatic Finance is embedded in our work together. With insight gained from years of industry experience and mind & body exploration, Gayles approaches wealth management with a rare combination of integral coaching, practical financial savvy, and spiritual depth.